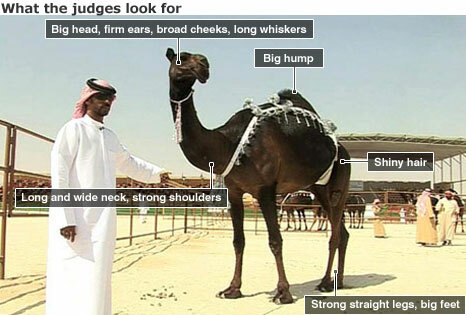 BBC News - How do you judge a camel beauty contest? How do you judge a camel beauty contest? They're tall, they're blonde, they're elegant, and at the height of their careers they can command millions of dollars. Supermodels? No, camels. In the remote Western Region of the United Arab Emirates, 28,000 of the humped beasts gathered at the end of January for what was billed as the biggest camel beauty contest ever. Normally, there's nothing there but sand, but the al-Dhafra Festival filled the arid desert with breeders and their herds, some of which had been driven from as far as Qatar, Saudi Arabia and Bahrain. The pens bustled with activity. Thousands of people from around The Gulf watched the action from the stands. A handful of judges sifted through the camel pens picking out the top talent. "The head is the most important thing and this is what we look at first," Mohammed Abdullah al-Mehairi, the head judge, told the BBC. "We are looking for camels with big heads, firm ears, broad cheeks and big whiskers. There is no single important thing - the neck and body should be long, the hump and the back should be big, and we also look at the colour and posture of the camel." Camels of different ages and types competed in 48 different categories - winning a total of $10m - during the 10-day festival, which ended on Monday. "The most important competition is the al-Bayraq lap where breeders put forward their best 50 camels and parade them around the track," Mr al-Mehairi explained. Hamad Rashed al-Marri took a month to bring his camels from Saudi Arabia on foot. His father was a camel breeder, as was his father's father, and this has become the biggest event in the camel calendar for him. Fifty members of his family travelled with him. "We start preparing the camels at least a week before the competition," Hamad told me inside his giant tent, as we sat drinking Arabic coffee. "Every breeder has his own recipe for the camel. I give them a combination of hops, grass, and corn, and we also give them milk and water. "We cover the camels because this helps keep their hair and skin shiny and healthy. If you leave a camel in the sun for too long its colour will turn pale." 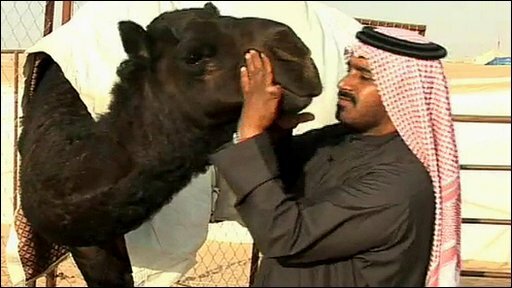 Hamad had a successful festival - four of his camels won beauty contests, which netted him four 4x4 cars. On top of this, he bought and sold millions of dollars worth of stock. While the average camel goes for around $7,000, others sell for much more. As well as snapping up beauties, breeders also buy camels to race and for their milk. "For the beauty camels I'm looking at the camel's head and height," says Hamad. "For racing camels they should be thin with strong legs." Camel trader Khalaf Sari Al Mazrouei said he had sold one camel for $2.7m. "The market this year is better because there are more people from the Gulf. The more there are, the more buying and selling there is. Today I bought a camel for $7,000 and I can sell it tomorrow for $10,000 or $14,000. "It's better buying in the auction than from the owner because I can get it for cheaper." But this festival is about more than just money, it's about prestige and status. Hundreds of families from all over the Gulf have set up camp. All the region's famous camel breeding families are here. National and family pride is at stake. "I cannot lie to you. People want to be number one, everyone wants to be number one," says Hamad. "Why? Because you get the media coverage and you get the money and you get the satisfaction. It's the best thing. People buy the camels, raise the camels, and spend money on the camels just to be number one."